With Christmas Day over and done, many people are concentrating their efforts on their upcoming New Year’s Day celebrations. While confetti, silly string and other party favors, and even bottles of champagne are acceptable gifts for your New Year’s Eve celebration at home, they just don’t seem to fit the bill when it comes to welcoming the new year at the office. One of my favorite ideas for workplace celebrations and New Year’s gifts for clients, coworkers and even the boss, is to purchase gift baskets. In the old days, gift baskets were often viewed as that gift you purchased when you simply couldn’t think of anything else. They were typically found at discount stores, and not only were they very generic, cheaply made and sparsely filled, but they were usually way over priced as well. These day’s however, the world of gift baskets has changed immensely. Not only are there more personalized choices available when it comes to gift baskets, but many are made with high quality, reusable containers, they contain an abundance of gourmet treats and beverages, and they are much more affordable than what one might think. Whether you are searching for ideas for something to bring to the office to help encourage excitement and motivation as we enter into the new year, or you are looking for a special gift to show your appreciation for coworkers, clients or your boss, gift baskets are an excellent choice. 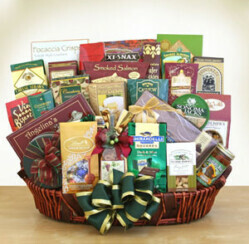 ChristmasGifts.com has a wide variety of specially made gift baskets available for almost any occasion, so you are certain to find just what you are looking for regardless of the intended recipient. One of my favorite gift baskets for a more professional setting is the Corporate Gift Basket that is offered exclusively from Pro-Gift-Baskets. 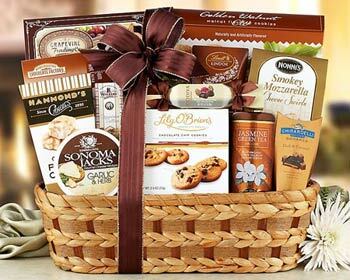 This impressive wicker basket is filled to the brim with such a variety of mouthwatering treats that it is certain to please even the most finicky of recipients, and with all these goodies, there is sure to be plenty to share at the office. Recipients will enjoy such delectable delights as chocolate truffles, peanut crunch, toffee and caramel squares to remedy that sweet tooth, and a cheese wedge, crackers and mozzarella cheese swirls for those who crave something more savory. Hot cocoa and specialty tea is also included to help wash everything down. The Corporate Gift Basket is affordably priced at just $70, and even includes free shipping! Have it delivered directly to your recipient’s residence or place of employment and save valuable time to ensure its arrival for the New Year. As we say goodbye to 2014 and welcome a year that is filled with new beginnings, the Corporate Gift Basket is just what your loved ones need to get the party started. What types of gifts do you typically purchase for special clients and business associates to help them celebrate the New Year? Let us know in the comments section below!